The inciting — and unsighting — incident. 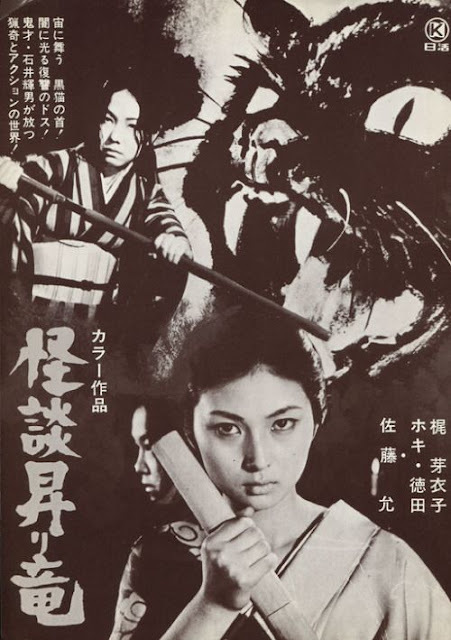 In the wake of a bloody yakuza clan feud during which she accidentally blinds the innocent sister of the Godan gang's leader, Akemi Tachibana (Meiko Kaji), de facto leader of the Tachibana clan following the death of her father, finds herself in a women's prison and plagued with nightmares involving a black cat that tasted the blood flowing from her victim's eye wounds. Once there, she bares her elaborate back tattoo of a dragon and formally introduces herself to her fellow female prisoners, accepting them as partners and members of her crime family for when they all get released. 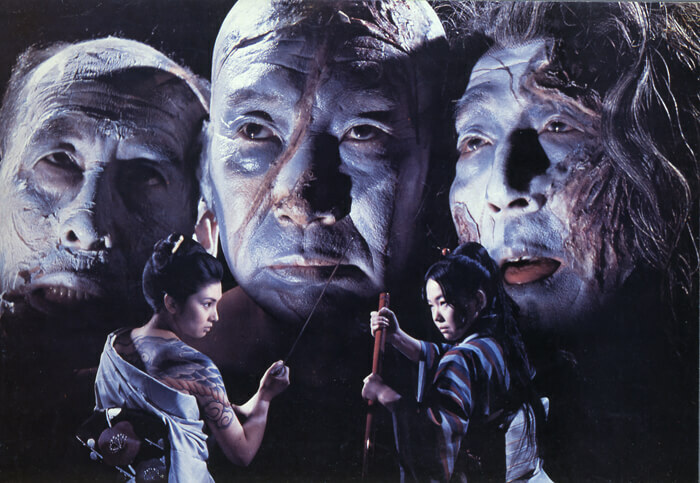 When her five-year sentence is served, Akemi and her girls are out and when she returns to her family's territory, she finds the area being usurped by the vile Dobashi clan, a pack of assholes who will stoop to the lowest of deeds in order to destroy Akemi's gang and officially take over the town, including pitting the Tachibana against the rival Aozora group in hope that they might wipe each other out. The situation steadily escalates but Akemi, realizing there's more going on than is immediately apparent, refuses to be goaded into retaliatory action, biding her time for the perfect moment in which to exact retribution. As a sign of respect and sisterly solidarity, Akemi's girls all get back tattoos that form a long dragon when they stand side by side, and the dragon tattoo also serves as the identifying "colors" of the Tachibana clan. Into all of this strides Aiko (Hoki Tokuda), a theatrical performer/professional knife-thrower and swordswoman who was the innocent girl blinded by Akemi. She has spent the five years after her blinding "training in the art of killing" and is now more than ready to exact her vengeance for both her brother and herself upon Akemi, so she joins forces with the Dobashi clan and immediately sets to work killing Akemi's girls and flaying them of their dragon tats. It all builds to a head that culminates in a sword-slashing bloodbath that puts paid to all wrongs, with Akemi and Aiko squaring off against one another in single combat, with surprising results, punctuated with the presence of the aforementioned black cat of Akemi's recurring nightmares. The one and only Meiko Kaji as the cursed Akemi Tachibana. Director Teruo Ishii, perhaps best known to U.S. audiences for bringing us the black & white Super Giant/Starman superhero films of the 1950's (which ran on American television throughout the 1960's and 1970's), turns in a fun and gorgeous-looking fusion of a female gambler/yakuza genre, Zatoichi-style blind swordsmanship tropes, old school Japanese "pinky" exploitation flavor, and traditional kaidan (ghost/horror story) tropes, and though billed as a horror yarn, the horror elements here turn out to more or less be beside the point. Sure, the spooky lighting and imagery and the black cat that may or may not be the symbolic embodiment of Aiko's "curse" of vengeance upon Akemi in ominous spirit form are intriguing, but don't let those elements fool you into believing this is a straight-up shocker. I've seen a legion of chambara/female gambler movies over the years and BLIND WOMAN'S CURSE falls squarely into that category, mild traditional horror flavors notwithstanding. Creepy imagery, yes. Straight-up horror film, not so much. Akemi and Aiko square off. It's a very entertaining film, don't get me wrong, but those who try to sell it as a "horror classic," as the DVD back cover copy would have you believe, are either barking up the wrong tree or simply lying their asses off. But I won't grouse too loudly, as its star is the always-welcome Meiko Kaji, who would later go on to screen immortality as the titular LADY SNOWBLOOD (1973) and LADY SNOWBLOOD: LOVE SONG OF VENGEANCE (1974). Interesting side note: the actress playing Aiko, Hoki Tokuda, was a singer who was married to TROPIC OF CANCER scribe Henry Miller. The details of their relationship are interesting and more than a tad bizarre, so go here to read up on it. Poster from the Japanese theatrical release.